150 SkillsUSA state Gold Medal winners will compete in three machining contest areas, Precision Machining Technology (PMT), CNC Milling & CNC Turning in Kansas City on June 24-27 at Bartle Hall. These contests are coordinated by NIMS, The National Institute for Metalworking Skills and major sponsors include Haas Automation, Inc., Sandvik Coromant, The Society of Manufacturing Engineers – SME, LS Starrett, Industrial Press and Immersive Engineering. Learn more at www.SkillsUSA.org. We hope to see many of you who will be attending SkillsUSA this year. 18 SkillsUSA Medal Winners at the three . . . The Vincennes University Business and Industry Division is excited to announce that Bob Nash has joined the Professional Staff in the Indiana Center for Applied Technology (ICAT). Bob's primary responsibilities will included joining HTEC Director Doug Bowman in teaching NIMS based CNC training classes, and to maintain the several machine tools in the CNC lab. Bob brings a wealth of experience to the position. A veteran of 14 years of service in the Vincennes University Precision Manufacturing Technology Program where he taught a wide veriety of classes, as well as maintained over a hundred ma . . .
Vincennes University hosted seven days of CNC lathe and Mastercam Multi-axis training for four instructors from the Workshops for Warriors program in San Diego California.The Gene Haas Foundation helped out by providing Teacher Training Scholarships, and VU instructors Bob Nash conducted the lathe training and Doug Bowman provided the Mastercam instruction. 'It was a great week! I am really impressed by what Workshops for Warriors is doing, and we are glad to help out in any way that we can. It was a pleasure to host the training and to work with such a great group of guys.' - Doug Bowman, V . . .
U.S. Manufacturing: The World's Third Largest Economy Author: Greg Galdabini During the recent recession, many observers wrote American manufacturing's obituary, claiming that it could no longer be a world leader because of intense competition from low-cost competitors. As ESPN College Gameday host Lee Corso is apt to say, "Not so fast, my friend." The U.S. manufacturing sector generates $1.7 trillion in value each year—equivalent to nearly 12% of GDP. It supports over 17 million U.S. jobs. About 12 million Americans—or 9% of the workforce—are directly employed in the manufacturing indust . . .
VINCENNES, Ind. - Sandvik Coromant has donated a $3,000 tooling certificate to Vincennes University’s HTEC CNC Training Center. 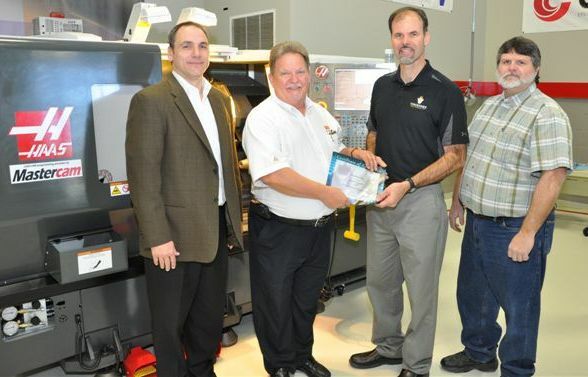 Sandvik representatives Frank Hornaday and Troy Wilt visited VU on Wednesday to present the certificate. Hornady says the company’s goal is to support VU’s HTEC with the proper tooling needed to offer a Mastercam CNC Lathe Certification class. “There is a great future in manufacturing and there is a huge demand for graduates coming out of schools like VU. I am in a sales role so I am out in the field a lot working with different companies and they just cannot . . .
Curtis Boggs, Sales Engineer, Haas Factory Out . . .